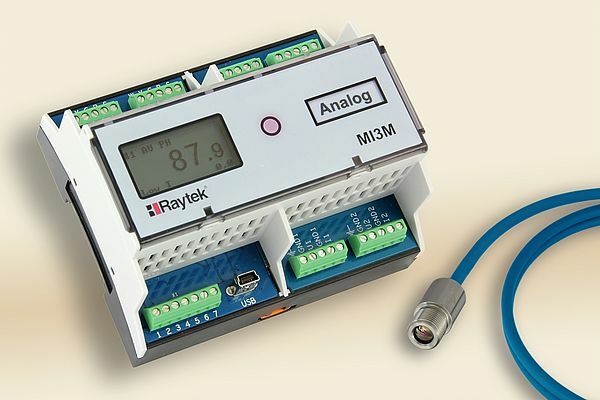 Raytek expands its MI3 product line for non-contact temperature monitoring by 6TE DIN rail communication box with four analog outputs that are galvanically isolated from the power supply as well as from each other. This box connects up to four MI3 sensing heads. Each signal output can be configured as 0/4-20 mA current or 0-5/10 V voltage output. Users can thus easily update existing measurement points to state-of-the-art non-contact infrared technology from the company, without any changes to the communication infrastructure. The analog box features an optically isolated relay output and a USB interface for comfortable pre-configuration. Each of the four analog outputs can be assigned to each sensing head, transmitting either measurement temperature or internal head temperature. The modular MI3 system provides very cost-efficient solutions especially for applications with multiple measuring points. In addition to the analog box, it includes a choice of digital communication boxes, optionally with Modbus and Profibus interfaces or fully sealed in an IP65-rated metal housing. Unique features of the complete line include digital communication from sensor to communication box, multiple sensing head design with up to eight sensors per communication box (for the boxes with digital outputs), automatic head registration for plug and play, and – directed particularly at OEMs – a stand-alone infrared pyrometer in a 28 x 14 mm stainless steel sensing head. MI3 sensors cover the full temperature range in one wavelength model. Long wavelength (8-14μm) models are available for measurement ranges of -40 to 600 °C and 0 to 1,000 °C. A special sensor for glass measures temperatures from 250 to 1,650 °C at 5 μm. Short wavelength sensing heads with integrated laser sighting for 500 to 1,800 °C (1μm) or 250 to 1,400 °C (1.6μm) provide highly accurate measurements even in case of emissivity changes. The robust MI3 sensors have very good EMC characteristics and can be used in ambient temperatures of up to 120 °C – that no extra cooling is required simplifies installation and cuts costs. The company furthermore supplies the dedicated DataTemp MultiDrop software including many sophisticated functions and complementing the MI3 system as a valuable solution for all kinds of applications, including printing, food processing, asphalt production, plastics processing, and machine condition monitoring.